This is untested, free, beta software. use/edit at your own risk. *Drag and Drop the "uvpipe_3_mod_by_hamLT.mzp" file onto your max viewport. *Restart Max or browse to the scripts folder "C:\Program Files\Autodesk\3ds Max Design 2011\Scripts\uvpipe" and manually run the script "uvPipe_3.ms"
*Change the Category to "_UV Layout Tools (by hamLT)"
*A box will come up asking for your "UVlayout.exe". I made some modifications to this Plug-in, maximum adjusting to my work nature. I split this out of the original 3DSMax script posting so it was easier for people to find. please reinstate my Credit and change log and add yourself to it, I've no problems with you using my code and branching but removing my credit looks disrespectful and dishonest. I change the log & UI, see first post. Sorry for negligence. I was looking at your code and I noticed you use a bitmap for the checker pattern. are you aware that max can create this for you with one of its built in procedural textures. I just noticed the new script and was excited to try it out. unfortunately I can't get it to run. Can you help me out? I am one version behind the latest UVlayout update. Could that be a problem? Ha! seconds after sending the reply I fixed my problem. 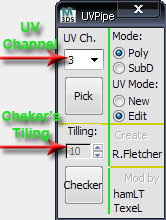 It seems I need to apply uvs to all three channels before running the plug-in. basically I applied an unwrap uv modifier to channel 3, collapsed the stack and ran the script. Please Give More Detailed Description For That Error !?! hey if you find bugs with the sending/receiving procedure could you post them in the original thread.